The larger of the two gull species breeding on Appledore, Great Black-backed Gulls (Larus marinus, or GBBG in the ornithology parlance) are massive, with a white head and belly, pinkish legs, and a slate-gray back as adults. It takes the birds four years to gradually attain adult plumage. The GBBGs in our project are banded with a silver, federally issued band, and a larger, field readable band with a white alpha-numeric code on a black background. Gulls breed on islands like Appledore to evade ground-dwelling predators like raccoons and skunks on the mainland. But islands are small, and don’t provide enough food for the birds to remain there year-round, or even to feed their young during the short breeding season. As a result, you may encounter Appledore GBBGs just about anywhere, and anytime. Our breeding birds are known to commute from the island to the mainland to find food for the growing chicks, so a bird you spot in Massachusetts at noon may be back on the nest by 2pm. Once the young have fledged, the birds leave Appledore and the island is quiet until the following spring. At that point, the birds disperse to points (known and unknown) all over the eastern United States. Our birds have been sighted as far west as Indiana, and as far south as Texas and Florida. Young gulls travel to more far-flung places than adults, so you may well encounter a subadult many hundreds of miles distant from the island of their hatching and rearing. We are always curious to know where these youngsters spend the years of their adolescence before returning to breed on Appledore. The smaller of our species, Herring Gulls (Larus argentatus or HERG) shares the white head and pinkish legs of the GBBG, but has a much lighter, silvery gray back. They share much in terms of ecology and behavior with GBBGs, though, being smaller, they are less predatory in their feeding habits. Their breeding season overlaps closely with GBBG, and the young hatch, are reared, and fledge at around the same time as their cousin species. As with the GBBG, Herring Gull youngsters tend to be spotted farther afield from Appledore the adults, which generally stick closer to their breeding island even in the off season. The HERGs in our study are each given a silver, federally issued band, and a larger, field readable band with a white alphanumeric code on a green background. In May 2007, a Lesser Black-backed Gull (Larus fuscus) was observed at a nest with a Herring Gull (Larus argentatus) on Appledore Island, Maine. This record represents the second observation of breeding by a Lesser Black-backed Gull in North America (outside of Greenland) and the first record for the Atlantic coast of North America (Ellis et al. 2008). On 22 June 2007, two chicks were observed at the nest; both survived until late July when one was killed by another gull. The surviving chick was banded, and appeared to fledge successfully. The Lesser was banded (“F05”) in 2008, and returned to nest every year except 2012 until 2015. F05, also known as “Pierre,” has paired with various female Herring Gulls over the years. He has not been seen since 2015, either on or off island, and is presumed dead. 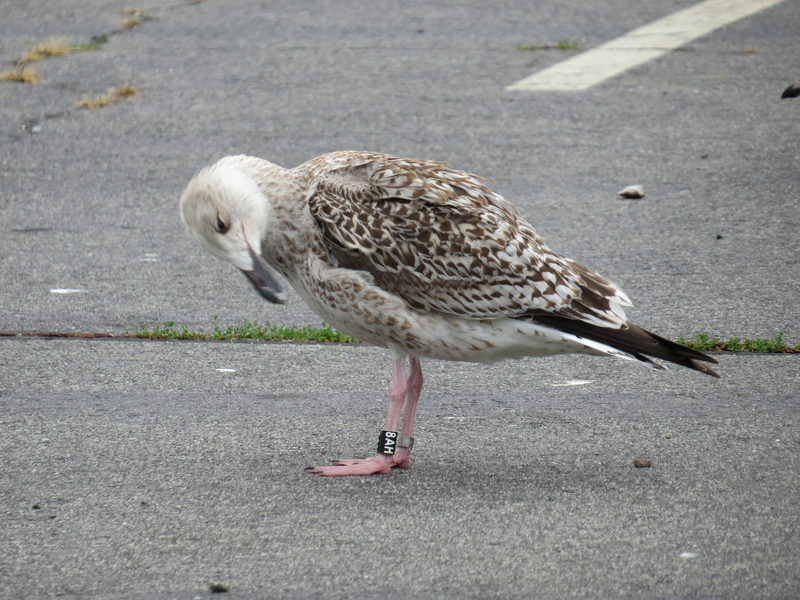 All birds have one metal (federal) band on the right leg and a field-readable plastic band on the left leg. All the plastic bands are GREEN with a 3-digit alphanumeric code (letter_number_number) in WHITE. The Lesser Black-backed Gull breeds primarily in northern and western Europe, but has undergone considerable range expansion during the past century (Post and Lewis 1995). The first record of a Lesser Black-backed Gull in North America (outside of Greenland) was in coastal New Jersey in 1934 (Edwards 1935). Records of this species in North America increased slowly from 1950 through the mid-1970s, then increased substantially thereafter. By 1994, this species had been reported in all 31 states in the eastern half of the US except for West Virginia (Post and Lewis 1995). Most observations of Lesser Black-backed Gulls along the Atlantic coast of North America occur from October through April, but increasingly the species is observed between May and September. Wintering birds may come from Greenland or Iceland, where breeding populations of Lesser Black-backed Gulls have been increasing (Cramp and Simmons 1983; Boertmann 2008). The only other record of a breeding Lesser Black-backed Gull is from Juneau, Alaska on 12 June 1993 (vanVliet et al. 1993). A Lesser Black-backed Gull was observed with a Herring Gull at a nest with two eggs in the middle of a small mixed colony of Herring gulls and Glaucous-winged Gulls (Larus glaucescens). That nesting was apparently not successful; the authors visited the site six weeks after the initial observation and found egg shell fragments and dried egg shell membranes near the nest, along with both members of the pair. They did not locate any evidence of juvenile birds at or near the nest. Putative hybrids between Herring and Lesser Black-backed gulls have been observed in some eastern states, including North Carolina, Connecticut (www.fordham.edu/lewis/birds/comhyb/herxles.html), and New York (www.birds.cornell.edu/crows/lbbgull_hybrid.htm). These observations, combined with records of large numbers of wintering Lessers and observations of juvenile-plumaged birds, suggest that there may be breeding populations in North America that have yet to be discovered. Boertmann, D 2008. The Lesser Black-backed Gull, Larus fuscus, in Greenland. Arctic 61:129-133. Ellis, JC, MC Stoddard, LW Clark. 2008. Breeding by a Lesser Black-backed Gull (Larus fuscus) on the Atlantic coast of North America. North American Birds 61:546-548. Post, PW, RH Lewis 1995. 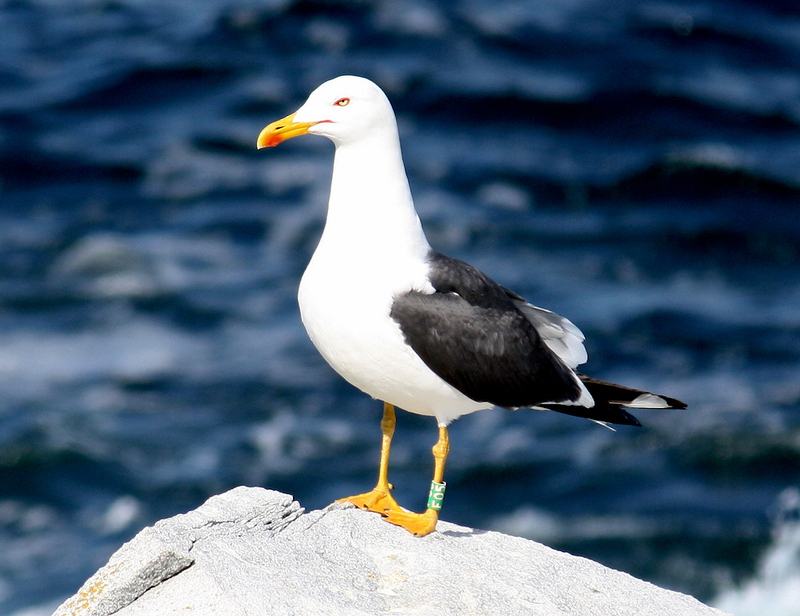 The Lesser Black-backed Gull in the Americas: occurrence and subspecific identity. Birding 27:282-290, 370-380. Edwards, JL 1935. The Lesser Black-backed Gull in New Jersey Auk 52:85.
vanVliet, GB, D Marshall, D Craig, J Egolf 1993. First record of nesting activity by a Lesser Black-blacked Gull (Larus fuscus) in North America. Bulletin of the Pacific Seabirds Group 20:21. Our work in has been conducted with a great deal of logistical support from the director and staff of the Shoals Marine Laboratory (http://www.sml.cornell.edu/). We are also grateful to David Brown, Marc Dantzker, and Ian Fein from the Cornell Lab of Ornithology for video and audio footage of the pair. Steve Bogdanowicz (Cornell Univ) is contributing substantially to this project by conducting all of the genetic analyses. 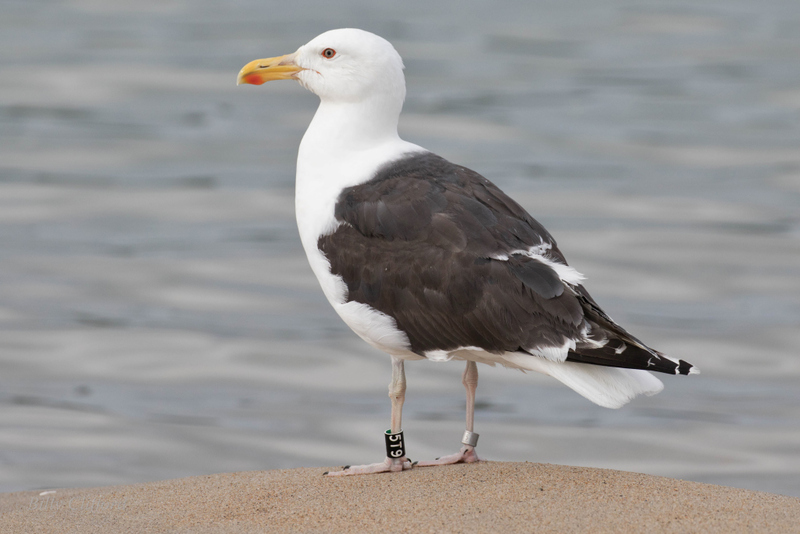 Ellis is sub-permitted to band gulls through Sara Morris (Canisius College), and has IACUC approval for gull capture and banding through Tufts University. We also greatly benefited from discussions about the history of Lesser Black-backed Gulls in North America with Bill Etter (esbittern “at” verizon.net). If I recall correctly there was some uncertainty as to whether the Alaskan nesting record referred to an asiatic dark-mantled taxa (eg. heugleni), rather than the European-derived Lesser Black-backed Gulls (graellsii) that are expanding into eastern North America and breed in Greenland/Iceland. Makes the Appledore nesting all the more significant. Here’s another photo of F05 Saturday, Jan. 17 at New Smyrna Beach, FL, making this bird almost 7 years old. hmmm won’t let me past it here. I had a sighting of LBBG F05 at Daytona Beach Shores on January 21, 2015 at 14:00. I do have a photo if you would like it.